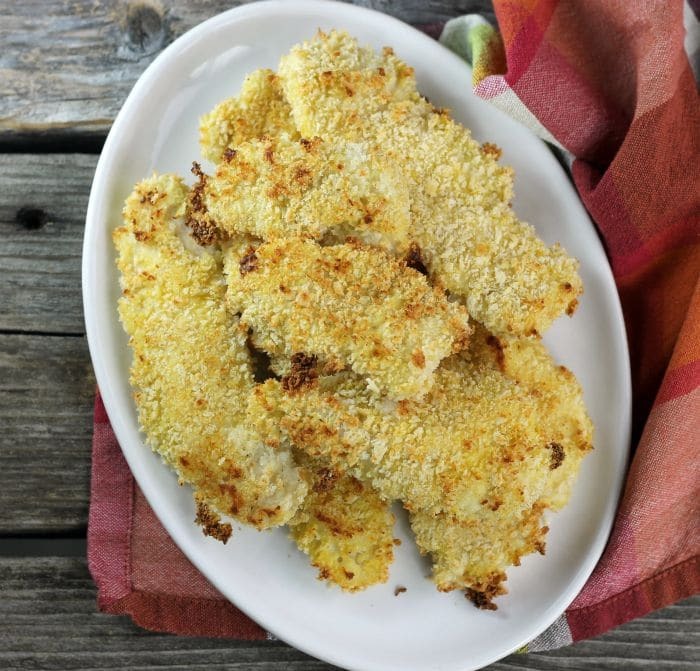 Crispy baked chicken strips are baked in the oven for a healthier chicken strip version than your fried chicken strips. Our two oldest grandchildren love their chicken strips. When we go to a fast food restaurant with them you never have to ask them what they want to eat. Its chicken strips all the way. So I have been working on a chicken strip that they would love to eat, but a healthier version of what you can buy in the fast food places. I have made them several times for them and made some changes along the way. The last time I made them happened to be this past weekend. The grandkids were staying overnight so I decided to make them for dinner. My granddaughter who is already five (where does the time go) told me that she thought they were amazing. And you know that I am going to love hearing that. They love the baked chicken strips as much as the fast food ones and they didn’t even know that grandma’s chicken strips were healthier and so much better for them. I used chicken breast and cut them into the strips, but you could buy chicken tenders if you prefer. 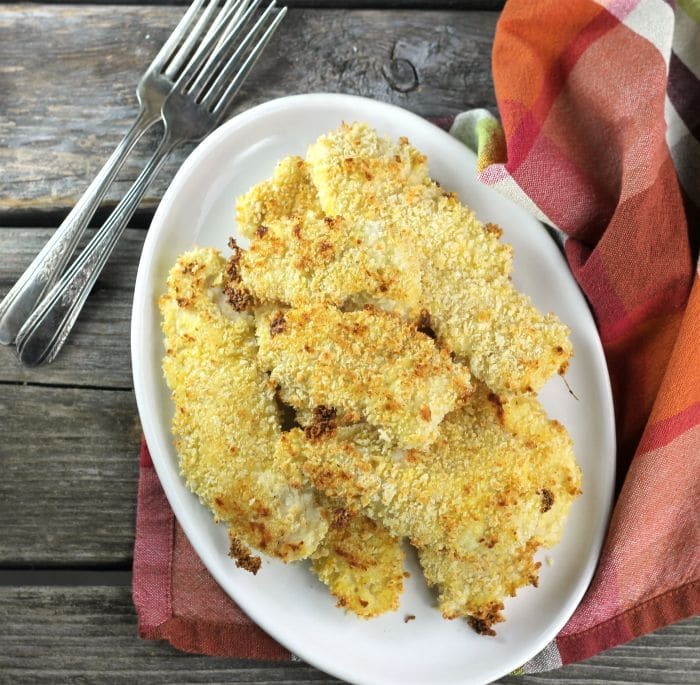 The chicken is marinated in buttermilk for a couple of hours, then dredged in flour, then egg, and then in panko breadcrumbs. They are baked in the oven until they are lightly brown and crisp. Also, it is always cheaper to make your food at home versus going out to eat, which is always a bonus. Preheat oven to 375 degrees F. Line two baking sheets with aluminum foil and spray with a non-stick cooking spray. Set up 3 bowls for the different steps of coating the chicken. In the first bowl mix together the flour, garlic powder, onion powder, salt, and pepper. In the second bowl mix the egg with the water. In the third bowl add the panko breadcrumbs. Drain the chicken and discard the buttermilk. 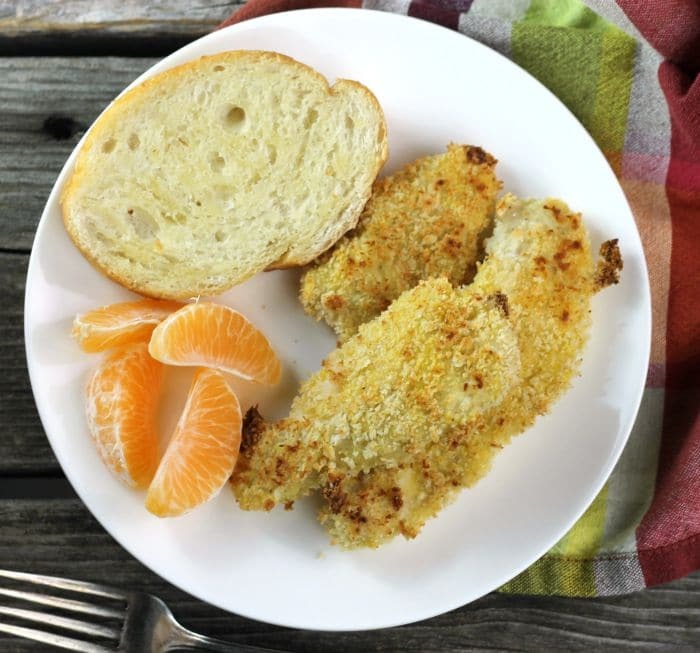 Dredge the chicken in the flour mixture, then dip in the egg, and finally roll in the panko breadcrumbs. Place the coated chicken strips on the baking sheets, about 2-inches apart. Place in the preheat oven and bake for 10 minutes. Turn the chicken over and bake for another 5 minutes or until chicken strips are no longer pink inside. Very crisp and so much healthier than the fried version! Very cool. I love stuff baked vs fried. The air fryer (aka fan/convection), cooks these kinds of things well, too. Whatever the oven, I’ll take it any day of the week, over deep fry. Kids of all ages like chicken strips! These look SO good. And I really like that they’re baked, too — so healthy and easy to prepare. Thanks! 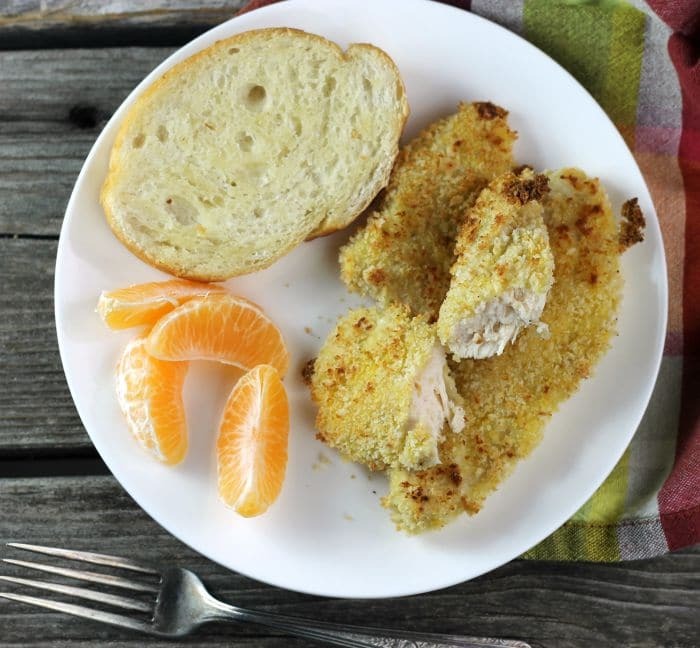 We love chicken strips and I like that these are healthier! They look great! Thanks! Your story totally reminds me of my sister. When we were younger, she would always order chicken strips when we went out. And you know what…not much changes! She still loves chicken strips. 🙂 This homemade version sounds excellent, Dawn! !